Here are directions to come visit our Carmel. Take Interstate 79 south to route 422 east into Ebensburg. Proceed into town. At traffic light, turn left. Continue straight at next light. After crossing railroad tracks, make left at light at gas station onto Manor Drive. Follow Manor Drive approximately 6 miles to Loretto Carmel, which the first Monastery on the right. If you pass St. Francis University, you’ve gone too far. Take Interstate 270 north to Interstate 70 west to Breezewood, PA. In Breezewood, take the Pennsylvania Turnpike (Interstate 76) west to Bedford (Exit 11). # Make left at the stop sign after toll booth. At top of hill, make left onto Route 220/ Inter- state 99 north (Altoona). Follow 220/ I-99 North to exit marked Route 22, Ebensburg/Hollidaysburg. * Proceed on Route 22 west to exit marked “Cresson/Summit”. Turn right at end of ramp onto old Route 22. At first traffic light (intersection with Route 53) proceed straight and pass beneath railroad overpass. Approximately 200 yards beyond the overpass, after the Dollar General, bear right onto Cresson-Loretto road. 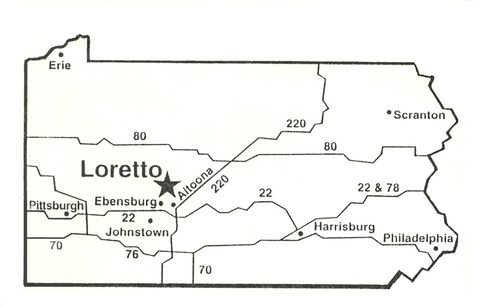 Follow this road approximately 4 miles into the town of Loretto. At monument/traffic circle, bear left onto Manor Drive. The Monastery is approximately 400 yards on the left. Take Interstate 80 west across New Jersey and Pennsylvania to Milesburg (Exit 23). Follow Route 220/Interstate 99 south into Altoona to Route 22 west. Continue as above *. Take Pennsylvania Turnpike (Interstate 76 west) to Bedford (Exit 11). Continue as above #. Follow Interstate 78 west to Interstate 81 south. Proceed to Pennsylvania Turnpike (Interstate 76 west) to Bedford (Exit 11). Continue as above #. Follow Interstate 81 south to Interstate 80 west. Exit at Milesburg (exit 23). Follow Route 220/Interstate 99 south into Altoona to Route 22 west. Continue as above *. Take Route 22 east from Pittsburgh. Exit at Ebensburg/Loretto exit. (This is the second Ebensburg exit). Bear right at end of ramp. Proceed straight (crossing over Route 22). Turn right at light onto Manor Drive. Follow Manor Drive approximately 6 miles to Loretto Carmel, which is the first Monastery on the right. If you pass St. Francis University, you’ve gone too far.